​Cazenovia, NY (January 29, 2016) - The Art Gallery in Reisman Hall on the Cazenovia College campus presents “Dwight Williams (1856-1932): Artist, teacher, scholar, Cazenovia’s son,” an exhibition of his works now through February 25, 2016. Located at 6 Sullivan Street in Cazenovia, at the corner of Sullivan and Seminary streets, the gallery is free and open to the public Monday through Thursday from 1 to 4 p.m. and then from 7 to 9 p.m.; Friday from 1 to 4 p.m.; and Saturday and Sunday from 2 to 6 p.m. The show is a collaboration between The Cazenovia Public Library and Cazenovia College. Dwight Williams, the son of a Methodist minister, was an American landscape painter and teacher of art. He was born in Camillus, New York, and spent most of his life in Cazenovia. Williams attended Cazenovia Seminary and studied with landscape painter John Calvin Perry (1837-1894) of Delphi Falls. Williams became head of the seminary’s art department in 1885, and later taught painting in Virginia at Norfolk College and the National Park Seminary, a finishing school near Washington, D.C. He returned to Cazenovia in 1900 and remained there until his death in 1932. Although physically impaired, he enjoyed the outdoors and was an avid fly-fisherman. He was an active member of the Cazenovia community, serving as a town and village historian. 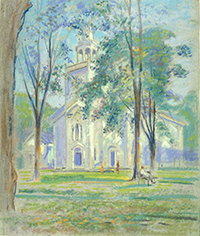 Williams is most known for his pastels, although he left many fine examples in oil. The landscape was his preferred subject. He was a teacher and mentor to the American artist Arthur B. Davies (1862-1928). They frequently painted together among the fields and hills north of Utica and along Cazenovia Lake. Gallery Director Jen Pepper is excited about this addition to our campus showcase. "I am excited about collaborating with the Cazenovia Public Library on this exhibition and getting to handle Dwight’s beautiful oils and pastels of Cazenovia village, his travels to Mexico, Morocco, Ireland among other landscape jewels." Williams paintings are held at the Smithsonian American Art Museum and the Phillips Collection in Washington, D.C.; the Columbus Museum of Art, Ohio; the Everson Museum of Art, Syracuse; and the Munson Williams Proctor Institute in Utica. The Cazenovia Public Library holds an extensive collection of Williams’ paintings bequeathed to the library by Richard L. and Prudence Burg Hubbard. Richard Hubbard was the son of Robert F. Hubbard, Williams’ friend and longtime patron. Lorenzo State Historic Site and Cazenovia College also own Williams works as do many local private collectors.